In areas with unpredictable or extreme weather conditions, outdoor car covers are necessary to protect the cars. The covers help to protect the car paint from a crack or lose their shine. In areas where there are dust problems such as sandstorms, the covers will help protect the car from the dust and sand. There are car and truck covers that are made to fit a particular car or truck model but there are also car and truck covers that are universal. In order to get the best possible cover, one has to look out for certain features and designs that can withstand the tough weather condition. Universal covers are made to fit on any car regardless of shape and make. Custom fit car covers are made to fit and hug the exact curves and protrusions of the specific models. 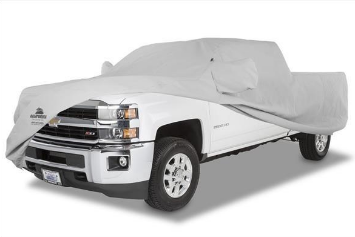 Some car covers are specifically made for outdoor protection, while some which are of the lighter and softer materials are for indoor functions. Car or truck covers come wrapped up in small bags. They are easy to fit and when not in use, they are kept safely away back in the small bags. There are many reasons why car owners choose to cover their car. After spending so much on an expensive car, one would want to preserve and maintain the good condition of the car for as long as possible. To protect against weather and natural elements such as sun, snow, rain, and moisture. To prevent dulling of car paint, cracking and peeling of interior materials e.g. seats. To protect from bird droppings, or coating of dust, pollen, and etc. To protect from cats, chickens, squirrels, and even birds from getting on your car and leaving behind scratch marks on the paint surface.